Hormones are usually blamed when we gain a few pounds. But, truth is, your hormones can also help you reach your weight-loss goals. That’s because your hormones affect your eating habits and metabolism in ways that help promote weight loss during certain weeks of your cycle. Once you know how to harness these pound-melting hormonal influences and how to overcome hormonal hurdles that have been blocking your slimming goals, you can finally be successful in dropping a dress size (or two or three). Read on to learn how to take advantage of your body’s hormonal benefits and dodge hormonal diet saboteurs each week of your cycle…. While it’s true you may get off to a slow, tired, achy start due to your period, this week is actually perfect for starting–or rededicating yourself to–a weight-loss regimen. That’s because as estrogen rises throughout your Week 1, it boosts optimism and inner strength, making it easier create–and stick to–diet and exercise resolutions. Even better, cravings for sugary, salty, fatty and carb-rich foods that plagued you during the second half of your cycle due to progesterone ease up as this hormone makes a hasty exit. On top of that, research shows you’re naturally eating a little less now than you did during the second half of your cycle thanks to rising estrogen, which has a mild appetite-suppressing effect. While pep and endurance start out low in the first half of this week, they grow in intensity by the second half thanks to rising estrogen, giving you more energy to work off the weight. Your Week 1 weight-loss challenges: If you end up caving in to temptation by eating a food on your no-no list, rising estrogen is giving your brain a bigger buzz from it, making it difficult to cut yourself off before doing real damage to your calorie count. And if you’re bothered by menstrual cramps, you may be tempted to soothe away the pain with indulgent snacks. To reach your weight-loss goal: Start by mapping clear, practical and attainable diet and exercise strategies–don’t let estrogen-fueled optimism let you bite off more than you can chew or you could give up altogether. Then, take advantage of these low-craving days by eating more high-nutrient, low-calorie foods such as fruits, vegetables, whole grains and lean protein sources. Finally, monitor your eating habits (for instance, by eating mindfully or jotting down what you eat in a daily diary) to help you become more aware of when you’re about to go overboard with snacks or portion sizes. If you do tuck into your favorite munchies, use portion control dishes or dole out a small serving so you don’t accidentally eat more than you intended. Peaking estrogen and testosterone amp up the positives from last week–you’re still enjoying a slight-appetite suppressing effect, you have loads of energy and endurance, and your optimism keeps you motivated about reaching your weight-loss goal. These rising hormones also make you more open to trying anything new, including healthy recipes and workout routines. This makes it a great week to amp up your efforts by joining a support group or exercise class, fitting in an extra workout and challenging yourself to swear off one high-calorie baddie altogether, like soda, ice cream or chips. Your Week 2 weight-loss challenges: High hormones are also amping up all the negatives from last week–once you start munching, it may be difficult to keep calorie counts in check because it tastes so darned good. What’s more, you may feel so overly confident about reaching your goals that, if you do overindulge in calorie-rich foods, you’ll try to convince yourself you’ll be able to make up for it by cutting back on something else or exercising more. You have one more challenge to your weight goal this week: Peaking estrogen makes your stress response more intense, which can prompt the production of stress hormones, like cortisol, that trigger food cravings and emotional eating. To reach your weight-loss goal: Continue monitoring your portion sizes and keep stress levels in check by taking a walk, meditating, doing deep, slow breathing, or sipping chamomile tea at the first sign of tension. The excitement and confidence you had about your weight loss goal during the first two weeks of your cycle may be replaced by fear and self-doubt. That’s because estrogen and testosterone are plunging, taking your confidence with them. What’s more, progesterone rises all throughout Week 3, and this prompts bloat by triggering constipation and water retention, making you feel like you packed on 10 pounds overnight. But, it’s not all bad news: Research shows that progesterone helps your body burn up to 30% more fat during exercise all through Week 3 and most of Week 4! Your Week 3 weight-loss challenges: You may get suckered into thinking you blew your diet because of the one or two pounds you put on this week; the constipation and water retention from rising progesterone are the likely culprits, which means the weight gain is probably temporary. However, this hormone is also triggering cravings for sweets, carbs, fats and salty foods, making them more difficult to resist when you go grocery shopping, to the movies, parties or anywhere else munchies may be within reach. What’s more, this sedating hormone is making your energy drag, so you may not feel like getting up off the couch to exercise. 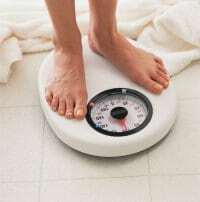 To reach your weight-loss goal: Combat a weight-loss stall by shedding those extra progesterone pounds with high-fiber foods (such as whole fruits, vegetables and grains) along with water to ease constipation and try natural diuretics (such as asparagus, melon and dandelion tea, as long you have no ragweed or rubber allergies) to eliminate water retention or sweat it out through exercise. Also, try to avoid salt since it exacerbates bloat. As for cravings, when the urge hits, go for a short walk, play a video game or read for a few minutes. Research shows that distracting yourself for a short while helps you get past food yearnings so they fade without you giving in. Finally, motivate yourself to move by reminding yourself that your body burns 30% more fat during exercise. Then take advantage of this biological blessing by doing fun activities that get your heart pumping, such as hopping on a bike or dancing. Okay, so cards on the table: This may be the hardest week of your cycle when it comes to sticking to your diet. That’s because plunging estrogen drags down the feel-good brain chemical serotonin, which can sap willpower, make you feel like you somehow failed in your weight loss efforts and/or that you don’t see any positive changes in your body. If you can get past those negative feelings and not let them sabotage your goals, you can actually use Week 4’s hormones to help you slim down faster. That’s because progesterone is still making your body burn up to 30% more fat during exercise up to two days before your period! Your Week 4 weight-loss challenges: To make up for your lack of serotonin, your body will push your toward comforting carbs (such as cookies, bread, cake, pizza, etc. ), because they boost serotonin levels back up. (Ever notice how grouchy people get while doing low-carb diets? Mystery solved.) Plunging estrogen is also making you more sensitive to aches and pains during your workout and driving down your pep and endurance. As a result, you may tire out easily or find it harder to do you usual exercise routine. To reach your weight-loss goal: When you get a hankering for carbs, remind yourself that “simple” carbs (like sugar and white flour) aren’t the only serotonin-lifters around. Healthier carbs (like whole grain bread, brown rice and beans) also boost flagging serotonin back up. Even better, they’re filling and help stabilize blood sugar, so you’ll naturally eat less at meals. You’re still experiencing bloating and constipation due to progesterone, so continue with Week 3’s tips for combatting both. And, finally, if you feel like giving up altogether on your weight-loss goals, just remember it’s simply due to plunging hormones. Try journaling your emotions or calling a friend for support. If you keep up the forward momentum, you’ll see in just a few short days you’ll be feeling optimistic and renewed about your weight-loss efforts once again.